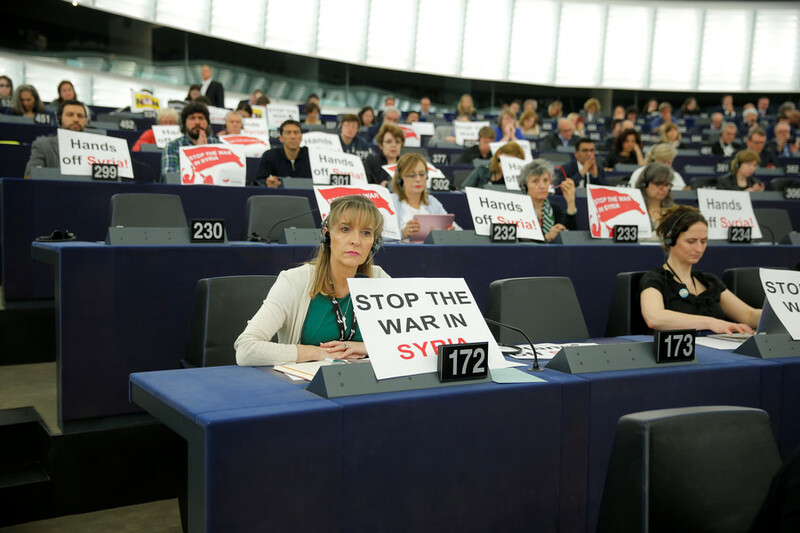 However, Macron’s impassioned appeal for unity was coldly received by more than a dozen MEPs, who displayed signs that read “Hands off Syria!” and “Stop the War in Syria” in protest at joint missile strikes carried out by the US, Britain and France against Damascus on Saturday. “Where was the democracy you talk about when you undemocratically attacked Syria President Macron?” Liadh Ni Riada, an MEP from Ireland’s Sinn Fein party, tweeted during Macron’s speech. Fellow Sinn Fein members Lynn Boylan, Martina Anderson and Matt Carthy were also seen holding the anti-war placards in defiance of Macron’s melodramatic call for European solidarity. In a debate held on Monday, France’s National Assembly roundly criticized Macron’s decision to launch the strikes without first obtaining a UN mandate. Assembly members denounced the strikes as illegal and carried out at the behest of Washington.